Talk radio callers and internet people alike are foretelling doom regarding Carmelo Anthony's return to the Knicks later this week. He'll need to share the ball with Jeremy Lin, the Socratic ideal of a point guard. (The ideal point guard shoots it all the time and turns it over a bunch, right?) The Knicks stumbled with the ball in Anthony's hands earlier this year, and they've thrived with it in Lin's hands. "I know there's questions about, 'Can I fit in?' 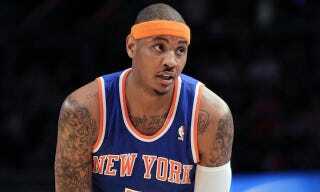 and stuff like that, but this is like a dream come true to me," Anthony said. "It takes some pressure off of me. I don't have to play point guard. I don't have to try to get Amare 20 points, try to get this guy 20 points, me try to go out there and get 25-30 points a night, play defense, rebound, do the whole thing." Yeah, that whole playing basketball thing is tough. Good thing Jeremy Lin has it covered.